RFMD and TriQuint Announce Merger: "Jumpin' Jack Flash"
I can't say that I am surprised at the news of RF Micro Devices merging with TriQuint given that I know from when I worked there that the RFMD management wanted to develop a line of general purpose and special purpose RFIC products that are designed into a wide array of products - not just cellphones and WiFi. That is not to say RFMD had not made progress in doing it independently; they had. This merger with TriQuint, though, will instantly give them an incredibly broad market share for RF communications devices. Official press releases from both companies mention that this is considered an equal merger, with neither company effectively 'buying out' the other. The reorganization will be done on a mutually equitable basis with a whole new company name and shared leadership. It does not mention how the merger will affect employee numbers (reduction in force, layoff, right-sizing, etc. ), but hopefully any change in workforce size will be positive. I still know a lot of great people at RFMD. "NewCo" is the name reported in the press releases of both companies. No, that is not the actual new name, but is a commonly used generic placeholder for an as-yet-to-be-named corporation. A new logo will be needed as well (too bad since RFMD just went to a lot of expense to redesign theirs last year). Along those lines, I did a little work to help them come up with a new name. The first thing I did was plug "rfmdtriquint" into an online anagram creator to see what it could come up with. It generated "Drift Qi Mr. Tun" and "Drift Qi Mr. Nut." "Qi" is "the circulating life force whose existence and properties are the basis of much Chinese philosophy and medicine." Some touchy-feely kumbaya types might swoon over such a name, but it probably won't fly with engineers (which I know many of the top brass at RFMD are). Those and the 5,000 others all sound more like headlines than company names, so the anagram approach is not going to work. Let us try another approach. The compound name TriQuint implies three quints. A quint is a sequence of five cards of the same suit. A run of ace, king, queen, jack, and ten is a quint major and one of jack, ten, nine, eight, and seven a quint minor. Quint is also a numerical prefix signifying five of something, as in quintuplets being five children being born to the same mother at the same time (approximately). So, a triquint could be three fives (555), 3 x 5 (15), a 3 and a 5 in sequence (35). A look at the About page on TriQuint's website reveals that the name comes from the III-V compound of gallium and arsenic on the periodic table (gallium arsenide, GaAs) - pretty clever, actually. RFMD began life as RF Micro Devices, but sometime in the mid 2000s the company decided to officially rename the company to RFMD, since that is the way most people referred to it. There was a big effort to remove references to RF Micro Devices and use only RFMD, but during that time even the internal company documents mixed the titles. At this point it really doesn't matter, I suppose. RF, of course, stands for "radio frequency." 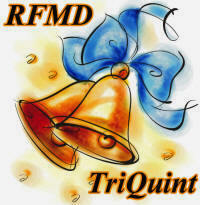 Knowing all that, what, then, might be a really good new name for the to-be-merged RFMD and TriQuint? How about "GaAs MD" as in "Web MD," implying physician-like mastery of semiconductor physics? No? OK, do you like, "GaAs Pipeline," suggesting an abundant, free-flowing supply of revenue generation? "Jumpin' Jack Flash," ... is a GaAs, GaAs, GaAs? "Noble GaAs?" OK, I give up. Maybe you have a good suggestion for them. My names might be dumb, but they're all still better than Agilent's new T&M spinoff name of "Keysight Technologies." How about a new company slogan? I still LMAO and ROFL when I think about the one offered by an RFMD group manager one day at a meeting: "Our GaAs Doesn't Stink!" From the press releases: "...today's transaction... is intended to qualify as a tax-free reorganization..." I wonder what that's all about? Are some mergers taxed and others not? See my Analog Devices and Hittite Microwave merger announcement. Update: The new name is formally Qorvo. "Qorvo (pronounced kor-vo). According to the company, 'Qorvo' is a combination of 'chorus' (a group of people working in unison), 'core' (origin, center of technology), and 'vo' (voyage or travel). "